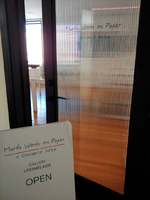 Marfa Works on Paper gallery re-opens Thursday April 4 in a new space and with a new name. In addition to works on paper by artists from Marfa and across the USA, the gallery now also shows contemporary ceramic arts. Located upstairs at 125 Highland Ave (which Marfans know as the newly renovated former thrift store building at the corner of Highland and Texas), Marfa Works on Paper + Ceramic Arts gallery hours are Thursday/Friday/Saturday 1 to 5.